I made this card for the Operation Write Home Christmas Card Challenge. I colored the penguins with Copic markers and inked the edges of the green and red pieces with Charcoal ColorBox Chalk ink. Thanks for stopping by. 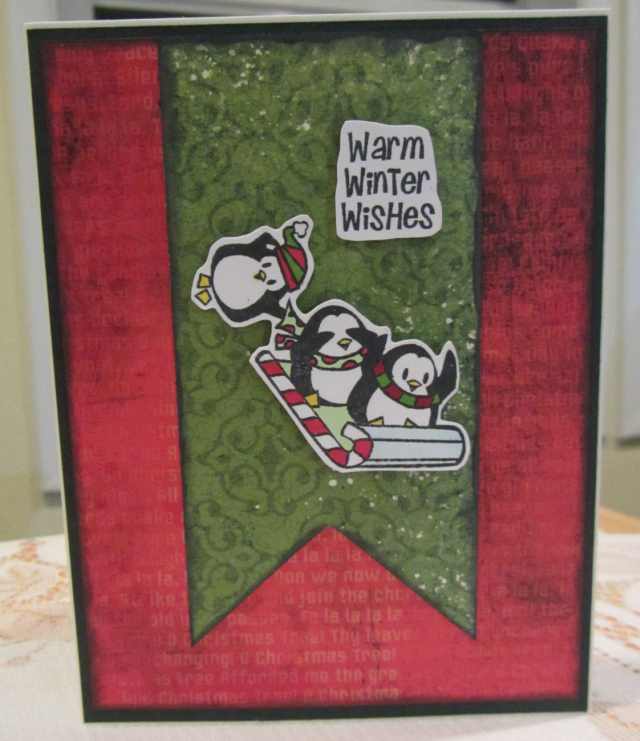 This entry was posted on Saturday, October 8th, 2011 at 10:11 pm	and tagged with cardmaking, Cat's Pajamas, penguins, stamping and posted in Challenges, Christmas, OWH, TCP. You can follow any responses to this entry through the RSS 2.0 feed. Great colors and fun image. TFS!!! Love the use of this image. What a cute card, I love the penguins! Thanks for playing in our Midweek Throwdown challenge at Operation Write Home!